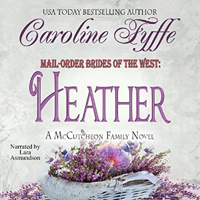 Mail-order-bride-to-be Heather Stanford dreads the day the matron of the St. Louis bridal agency finds her a husband and sends her west. Heather actually has no desire to marry; she just wants to free her struggling family from the financial burden of another mouth to feed. Still, she holds true to her plan when the fateful day arrives and Mrs. Seymour sings the praises of her prospective groom. Heather girds herself to leave behind all she holds dear and wonders if anyone can live up to the matron's glowing description. After a mill accident leaves Hayden Klinkner's father injured, Hayden is faced with the challenge of a huge order to fill--short-handed--on a tight timeline. Further complicating matters, the handsome, dyed-in-the-wool bachelor discovers his meddling mother has a surprise to share with him--a wife! With the pressure he's under, a wife--even one as lovely and suitable as Heather Stanford--is the last thing he needs. Y Knot, Montana is set abuzz when the "Mail-Order Bride Done Wrong" goes back on the market and every eligible man for miles around is interested. Hayden's eyes are now opened. Can he win back her heart before she says "I do" with someone else? OH, FOR HEAVEN’S SAKE! Heather Stanford swatted at a fly buzzing about her face and blew a wayward strand of hair from her eyes before it stuck to her moist forehead. Although they stood in the shade, the temperature was warm and growing hotter. She longed to go inside, especially as the scent of the livery yard drifted on the light breeze. Heather glanced from beneath her lashes at the group gathered in the backyard. All the bride hopefuls were there listening to Mr. De Rosa teach them about planting seasons, when to put in herbs for your kitchen garden, and how to keep pesky critters—Heather swatted at a bee this time—from stealing the best of what they grew. She nibbled at her bottom lip, thinking how the crooked little man with the pointed leather cap reminded her of a troll from the battered copy of Grimm’s Fairy Tales she used to read to her younger sisters at bedtime. But Mr. De Rosa wasn’t mean at all. He had a heart of pure gold. His eyes came alight anytime a bride hopeful asked a rare question, and a smile was never far from his lips. Rumor had it he was sweet on Dona, the cook, but Heather had never seen proof of that. It was difficult to picture the two of them together, him short, her tall and strong as an ox. Lina had found them face-to-face in the pantry, Dona with an expression of guilt, as if they’d been caught with their hands in the cookie jar. Heather’s lips twitched. Angelina Napolitano, or Lina as she liked to be called, nudged her when the sound of heavy iron wheels on brick and the clanging of cables was impossible to miss. “Listen. The cable car,” she whispered, leaning toward Heather. Heather tilted her head, singling out the sound amidst the chirping birds, buzzing from the honeycomb high in the alder, and Mr. De Rosa’s voice droning on and on and on. She nodded. “I hear it.” St. Louis’s first cable car line stopped only one street over on the corner of Knoll and Franklin. The conveyance’s distinctive chugging along Franklin Avenue permeated the air, then the conductor’s shrill voice called out the stop. All the girls turned, and Mr. De Rosa smiled and stopped talking. The novelty of this new mode of transportation had not worn off. “Attention, p-please, ladies,” Mr. De Rosa stuttered, calling them back to what they were doing. 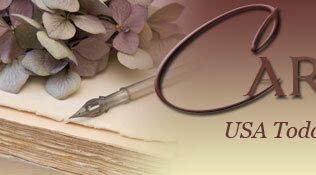 He held a pencil in his dirt-covered fingers. “Now, t-take the pencil and p-p-poke it into your prepared soil, three to f-four inches deep. Then p-p-plaaace your rosemary cutting inside.” He went about doing just that, a little hum coming from his throat as his son, Ernie, a good twenty feet away, pruned the dwarf plum at the back of the carp pond with large hedge shears. “I don’t know…” Heather didn’t want to dampen Lina’s enthusiasm, but she didn’t have money to spare. Even five cents was too much. Mr. De Rosa lifted his head and gave them the stop-whispering eye and pay- attention look. Lina was Heather’s closest friend. The curvy Italian with the nurturing spirit had recognized Heather’s reluctance to be a mail-order bride right off. At twenty-six, Lina was older than Heather by four years, and for the prior eight years had been a nanny for a fine family on the East side. After her boys, as she called them, had grown up and gone off to boarding school, she didn’t want to return to her crowded family home. Instead, she hoped to be a mail-order bride. She was sincere and smart, and Heather considered her the older sister she didn’t have. They were roommates, along with Bertha Bucholtz, in the attic dormitory. Kathryn Ford, the well-off socialite from Mount Vernon, inched forward. “I’ve never liked to work with the soil, really.” She held up her perfect, made-for-playing-the-piano fingers, studied them for a moment, then clasped them behind her back. Heather hid a smile. Her friend Kathryn was here in defiance of the man her father had picked out for her the day she was born. Imagine that. “A boor and domineering,” Kathryn had called him one afternoon when they were talking. Heather admired the young woman’s inner strength to go up against her formidable father like that, a powerful businessman in Boston. The delicate cape of Kathryn’s yellow chiffon dress, one much too expensive to be worn while gardening, draped elegantly around her shoulders, accentuating the golden highlights in her wavy chestnut hair. Heather’s heart, full of love and too many regrets, twisted a little more. She missed her family, especially her youngest sister, Melba. The fourteen-year-old grew frailer by the day. The whole family was worried sick, and the doctors couldn’t seem to figure out what was behind her deteriorating constitution. Heather clenched her eyes in frustration and willed away the fear that threatened to darken her heart. “It’s as ea-easy as that!” Mr. De Rosa smiled warmly at the group, and Heather was snapped back to the present. “And with th-that, we’re finished.” He set his things down, took a handkerchief from his pocket, and wiped his shiny forehead. Darcy Russell and Bertha Bucholtz meandered toward Heather’s group, joining them. “I’m h-hot,” a female voice said from behind a bush, the mimicking tone malicious. In that moment, Heather disliked Prudence even more than she already did. With each passing day, the woman thought up new ways to be mean and cruel. She often picked on the poor gardener, but any of them could also be her target. “That I do,” Lina agreed. “Yesterday I thought she was going to explode as I hurried in one minute past seven. Her eyes gave me a silent dressing down that scorched me to my pantaloons.” Lina winked one of her sparkling eyes. Heather took in the beautiful backyard. Yes, lucky indeed. Mrs. Seymour,the owner of the agency, took good care of her charges. She looked after her girls as if they were her own. All the other brides, however, did want a husband, and continually chattered about which kind they preferred. A summons to the matron’s office was the news the prospective brides longed to receive. The meeting meant Mrs. Seymour had found a potential match, and the woman fit the requirements of a particular bachelor looking for a bride. Once presented with the details of the suitor, the prospective wife-to-be had to decide whether he fit her dreams and desires as well. Then she wrote back to see if a match could be made. The house troublemaker was up to her usual tricks. Nasty and mean were her middle names. She enjoyed making others feel bad about themselves, and she especially liked to pick on Bertha. Prudence straightened her long, reed-thin body and patted the side of her glossy black bun. She liked to flaunt her shape, or lack of it, in front of Bertha, who was as plump as she was sweet. Bertha’s face flushed pinker, if that were possible, and her eyes blinked in pain. She spun and gathered the fan and bonnet she had set on a nearby chair, as if to hurry away. Everyone else remained frozen in shocked silence, as bees buzzed and the sun continued to shine. Heather feared Bertha might break into tears. Prudence’s sharp intake of breath sounded around the yard. Her lips curled over her teeth, and her chin jutted out like a knife. A second later, a violent trembling overtook her arms and legs and she reminded Heather of a starving dog ready to fight to keep its bone. Heather didn’t dare back down. Lina inched closer, as did the other young women. Ernie, pruning shears at his side, watched. Seemed they’d all chosen sides, and ended up with her. Prudence turned and stomped away. With their tormenter gone, Darcy, Kathryn, and Lina huddled around Bertha, drawing her into hugs of their own. 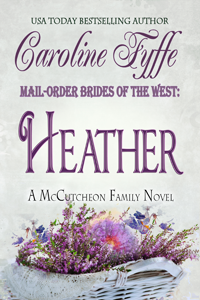 Heather smiled, thinking how the group of women reminded her of her own sisters. Her heart gave another sad squeeze. If she married and moved west, this might be the last few days she spent with them. And what about her little sister Melba, with her failing health? What would become of her? A thoughtful acknowledgment rippled through the group of girls as they remembered their friend. Trudy’s soothing force at the agency had been well appreciated, especially where Prudence was concerned. Trudy’s match had been made a couple of weeks prior, and she’d traveled west to Sweetwater Springs to marry Seth Flanigan. In the house, Heather took the handrail and started for the attic dormitory. The talk of Trudy made her think of her other friend, Evie Davenport Holcomb, the agency’s longtime maid who’d sneaked away early one morning and traveled west. The girl was almost a hero around the house. Unbeknownst to Mrs. Seymour, and in search of true love, the maid had secretly taken letters that had been sent to the agency from an eligible bachelor. Without telling anyone, she began a correspondence with him, and in no time he asked her to wed. Such a romantic story! Later, when Mrs. Seymour learned Evie’s whereabouts, she packed her bags and went after her. That was over two weeks ago. Thank goodness the matron was due home tomorrow. Heather turned to find Lina hurrying up the stairs to catch up. Her friend held up the folds of the buttery-colored cotton dress so she wouldn’t catch the hem with the toe of her boot. The fitted bodice and scooped neckline were beautiful, and complemented Lina’s near perfect olive skin. They continued up the stairs side by side. Heather shook her head. Her brothers were already living at their uncle’s house to ease the financial burden. There was talk of Sally’s going to live at Aunt Tillie’s. “Perhaps. But…” Heather felt her face heat, and she turned away. “I don’t want to sound ungrateful, but—I don’t want a match.” Finally saying the words she’d been keeping to herself felt good. She stopped, knowing that Lena was excited about being a bride. She didn’t want to spoil her friend’s enthusiasm about getting married. Just because Heather’s father hadn’t been the best husband to her mother, or father to her and her brothers and sisters, didn’t mean there weren’t other good, decent men out there. She had no desire to raise a family all by herself and have her man come home with beer on his breath after too many hours away, and too much money spent. Regardless of his faults, she’d loved her father. She just didn’t want a husband like him. Her uncharitable thoughts kept her awake at night, along with her gnawing stomach—a heavy burden for a young girl to have. A smile played around the corners of Lina’s mouth. “You may be surprised. Marriage might agree with you. Who knows whom you’ll be matched with. Tall, dark, and handsome?” She made a slight curtsy, and then pretended to slip into the arms of an imaginary suitor. She waltzed gracefully around the second-floor landing as if at a ball. The bedroom door nearest the stairway opened, and Prudence stepped out. She drew up, surprised, then her eyes glittered and a deceptive smile played around her thin lips, making Heather take a tiny step back. Yes, she actually would heed Bertha’s warning. Prudence’s bitter soul might be capable of anything.